perform two concerts at the Bridgton Academy in North Bridgton on Friday, May 18 at 7 p.m. and on Monday, May 20 at 3 p.m. The singing group is made up of 55 members from fourteen surrounding towns including Windham and Raymond. They will present a varied program made up of traditional classical pieces, folk songs, spirituals, and a “Fiddler on the Roof” medley; along with some surprises as well. There is a recurring theme of hope, freedom and peace that ties the pieces together and will be pleasing to all who attend. The LRCC is directed by Jan Jukkola, Susan Stockwell and Dan Allen and the group is accompanied by Carolyn Stanhope, Sara-Sue Schreiber and John Waldie. The program will also include accompaniments by musicians, Rusty Wiltjer, percussion and Mark Priola, electric bass. They will be joined by instrumentalists from the chorus including Ginny Halligan, flute, Glen Jukkola, violin and Jan Jukkola, clarinet. The chorus would like to thank the Bridgton Academy for all their help and support; along with providing them with rehearsal space and a concert venue. They would also like to thank their enthusiastic audiences and local sponsors. The concert is free but donations to help cover the purchase of music and other operating costs will be gratefully accepted. 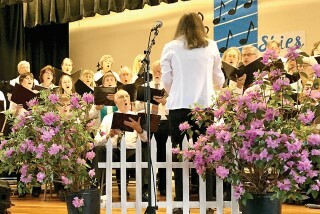 Come and join the Lake Region Community Chorus as they sing into spring. The concert is sure to be remembered long after the final chords are sounded.